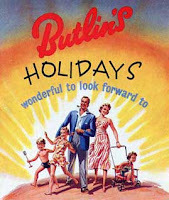 "A Big Gay Holiday Camp"
"a big gay holiday camp".How language has changed! Various shots seem intended to show clergy relaxing like any other holiday camper. I fail to be convinced of this by the sight of a Bishop (Dr Mervyn Stockwood) buying a newspaper while wearing a purple cassock and carrying his crozier. And were viewers meant to be surprised at seeing a clergyman accept a drink from a barmaid in "Ye Olde Pig and Whistle"?